This exclusive Dubrovnik hotel, with its location at the doorstep of the Old Town, is an ideal base for exploring all Dubrovnik sights. In a short walk from the hotel you can find yourself on bustling Stradun – main street of Dubrovnik dotted with interesting restaurants, outdoor cafés, galleries and souvenir shops. The most popular city beach, Banje, is only 10 minutes walk from Hilton Imperial Hotel. The cable car lower station can be reached in only 5 minutes walk. 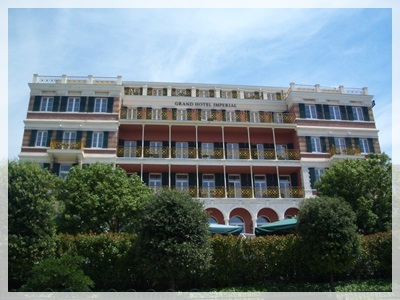 Hilton Imperial Dubrovnik is set in a historic building built in 1895 and private villa built in 1943. Hotel offers accommodation in 147 bright and spacious guestrooms, suites and executive bedrooms, all decorated with a Mediterranean decor and wooden furniture. All accommodation units feature a desk, laptop-compatible safe, telephone, blackout drapes, air-conditioning, minibar, tea/coffee making facilities, hair dryer, exclusive toiletries, Satellite TV, iron and a cosy signature bedding. Wi-Fi is also available (fee aplies). The private bathrooms are fitted with a bath containing an overhead shower. From your guestroom or suites you can enjoy amazing views over the Lovrijenac Fortress and the Adriatic sea. Porat Restaurant offers a wide selection of Mediterranean specialities base on local ingredients, complemented by a specially selected list of Croatian and international wines. At this restaurant you can start a day with a Continental and American hot and cold buffet breakfast. The Lounge Bar, located on the terrace of the Porat Restaurant, is a place for sipping coctail or enjoy a light lunch as you enjoy the soul and funk music. The Lobby Bar is the perfect setting for having a coffee, and informal meeting or evening cocktails. Guests staying in Executive Rooms and Suites enjoy access to hotel's Executive Lounge with a sunny terrace that offers views of the Old Town. Here they can have a complimentary continental breakfast as well as snacks throughout the day. Hotel's Beauty Line Center offers a world class wellness services – including facials, massages and body therapies. Spa services and facilities include fitness room (with range of equipment), swimming pool, sauna, steam room, massage treatments, face & body & hand and foot care, power plate training with personal instructor. Hotel's indoor swimming pool has a glass roof allowing natural light to flood into the pool. 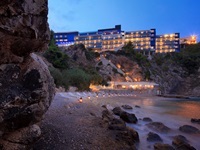 Hilton Imperial Dubrovnik has seven meeting and event rooms with space for up to 260 persons. Natural daylight in all venues, the very latest in audio-visual technology, highspeed internet access and creative catering options makes this hotel the perfect choice for organizing meeting or conference in Dubrovnik. Hotel offers a 24-hour desk with multilingual staff and concierge services, money exchange service, luggage storage and laundry facilities. Hotel has its own parking garage with 50 parking spots (monitored by 24-hour security) if you are travelling by car. If you arrive to Dubrovnik airport, take the airport shuttle bus which will drop you off only a few steps from the hotel. 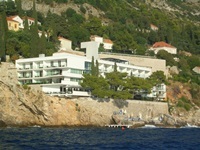 Hilton Imperial Dubrovnik has amazing location just at the doorstep of the Old Town and its historic sights. 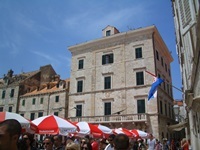 Only a few steps from the hotel you can catch local buses or take a taxi ride to reach other areas of Dubrovnik. If you are arriving by plane and taking an airport shuttle bus it will drop you off only a short walk from the hotel. For more convenient transfer from the airport you should book a private car transfer. Hotel has its own parking garage with 50 parking spots (monitored by 24-hour security) if you are travelling by car.